With owning a house being more or less a luxury for young professionals in “de Randstad“, many of us are stuck in a rented (studio) apartment for years. Apartments for rent are typically privately owned and often multiple apartments are created in what used to be just one “herenhuis”. When you sign a contract with the owner, he/she becomes your “huisbaas”: ‘house owner’ (literally ‘boss’). As many of us have experienced, in order to have a good and working relationship with your landlord, you will need to demonstrate sufficient negotiation skills and be capable of exercising the right amount of diplomatic pressure that will avoid him getting annoyed, but will finally have him repair your window!! When people have a landlady you will sometimes hear “huisbazin”, but in most cases “huisbaas” is understood to mean both. – Baas: boss [noun] [de baas, de bazen]. – Huis: house [noun] [het huis, de huizen]. – Huurhuis: rented house, house you rent [noun] [het huurhuis, de huurhuizen]. – Huren: to rent [verb] [huurde, gehuurd]. – Verhuren: to let, to rent [verb] [verhuurde, verhuurd]. – Borg: deposit [noun] [de borg, de borgen]. – Conflict: conflict [noun] [het conflict, de conflicten]. – (Huur)contract: contract, (rental) agreement [noun] [het contract, de contracten]. 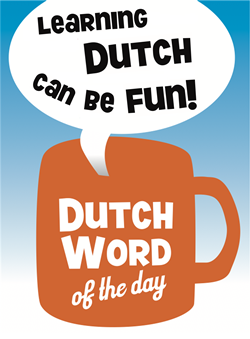 This entry was posted in Dutch word of the day, DWOTD 1.0, Vocabulary Intermediate and tagged huis, huisbaas, huren, huurhuis, verhuur by Sander. Bookmark the permalink.